Kirk Cousins’ first touchdown pass in live game action as a Viking couldn’t have been any shorter. But that doesn’t mean it didn’t impress his head coach as much as a dead-on deep ball down the sideline. Asked today what impressed him most about Saturday night’s opening touchdown drive, Mike Zimmer first mentioned the way the offensive linemen fired off the ball. Then he mentioned Stefon Diggs’ touchdown catch. 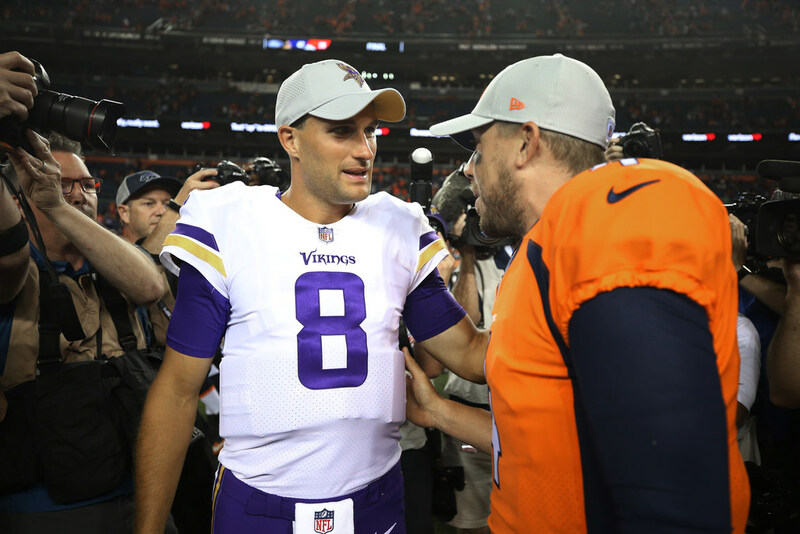 And then he got to the $84 million QB, who went 4 for 4 for 42 yards and a 150.0 passer rating in his only drive of the 42-28 preseason-opening win at Denver. And a throw — a slant pass through extra traffic at the goal line — probably isn’t one the Vikings would have called with Case Keenum a year ago. Cousins has the arm strength to zip that pass with confidence that it won’t get tipped. And he has receivers who can make that point-blank catch in Diggs and Adam Thielen. The Vikings skipped today’s morning walkthrough. They return to the practice field at TCO Performance Center from 2:45 to 5 this afternoon.